A peek inside The Olympic Museum in Lausanne, Switzerland which re-opened to the public in December 2013 after a major two-year transformation of the original building. A major renovation of the original building which was designed by Pedro Ramirez Vazquez in1993, and has now been renovated by Swiss architects Brauen & Walchli, has virtually doubled the display areas which have undergone a total metamorphosis as well as creating new exhibition space. At the same time a completely new visitor circuit has been designed, produced and installed by an almost all-British team led by Metaphor, Mather & Co, Paragon Creative and Centre Screen. To date 160,000 people have visited the museum since it re-opened at the end of last year and the projection for the first year after reopening is 250,000 visitors. Inside the museum, the exhibition area has virtually doubled in size to 3,000 m². Superbly located overlooking Lake Geneva, The Olympic Museum tells the Olympic story in an emotionally engaging way which takes visitors on an interactive journey of the evolution of the Games from ancient Athens to the present day. 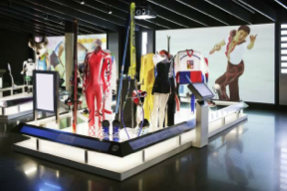 Three levels of completely redesigned galleries incorporate the latest technological innovations, using specially commissioned films and interactive displays to explore the history, dreams, challenges and values that have helped to make the Olympic Movement what it is today. 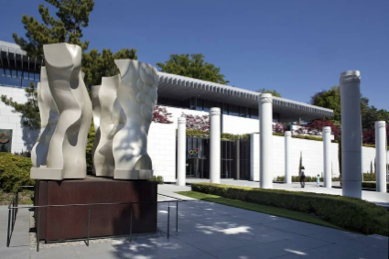 The new Olympic Museum features a free exhibition gallery offering a magnificent view over Lake Geneva and the Alps, plus reception and conference facilities with a 175-seater auditorium, meeting rooms, shop, restaurant and banqueting suite offering a unique Olympic experience. When the plans for the renovations took place, the priority was to ensure that the next generation of museum-making would be sustainable. 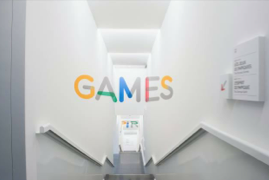 Also, that there would be enough space to receive additional collections with the advent of each edition of the Games, and to house the research department of The Olympic Museum. in addition, the display space was increased and now stretches over three levels. The roof covers the terrace which consists of ultra high-performance concrete. instead of reinforcing concrete with bars as is usually the case, B+W Architecture SA decided to bolster it with steel fibres. As a result, it is very durable and very strong. This new material allows the architects to produce beams which are very thin and very long. The museum experience begins in the Olympic Park, designed by the Lausanne-based landscape architects L’Atelier du Paysage. 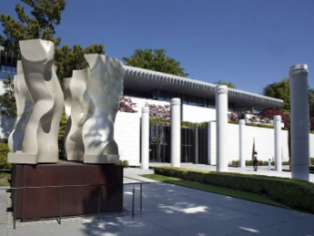 The park integrates the museum’s collection of over 30 sculptures, which includes Botero, Niki de Saint phalle and Jean Cardot. It also offers more athletic visitors the chance to test their own Olympic skills on the 100 metre athletics track and try to beat Usain Bolt’s record time, while the fire that burns eternally in the cauldron by the museum’s entrance offers a permanent reminder of the origin of the Games. The great Olympic staircase forms a link between the Quai d’Ouchy and the forecourt at the entrance to The Museum. It winds around landings which each host bronze sculptures illustrating a number of Olympic disciplines. Visitors ascend the spiral ramp and begin their visit at the uppermost level. This is also a journey that follows the torch relay. Everyone’s journey begins in the Olympic World and in Ancient Greece. It also takes the visitor from the ancient games at Olympia, through their revival by Pierre de Coubertin in the late nineteenth century, to the 204 National Olympic Committees and the four billion people who, as participants or spectators, shared de Coubertin’s visionary fire at the most recent Games. Next comes the Olympic Games themselves. The drama and excitement of these extraordinary global events is conveyed using the latest audiovisual immersion techniques and an interactive database of over 1,000 video sequences. The Olympic Spirit explores the daily lives of athletes before, during and after the Games: their lives, dreams, values and the challenges involved in pushing their limits. The climax of the visit is a 180-degree audio visual show directed by acclaimed sports film-maker Daryl Goodrich, whose film Inspiration helped London win its 2012 Olympic bid. 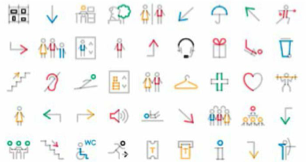 Base Design created the new graphic identity for the reopening of The Olympic Museum which has been utilised in all the signage throughout The Museum. Base Design developed a unique sans serif font which is half colour and half grey. Where the two colours overlap, there’s a darkened dot of hues which symbolise a relay. Situated on the top floor of The Olympic Museum, the TOM Café stands out for its contemporary decor and its colourful sporting atmosphere. People can access the café directly after their visit, or whenever they wish, via the northern entrance, without needing to pass through the exhibition areas. The legendary items from the Olympic Games presented on the large wall panels surrounding the bar have been a hit with visitors. Two educational areas, the Gym and the Studio, are part of the new educational facilities. Equipped with the latest educational and teaching equipment, these two areas, each covering almost 150m², enable more than 25,000 children and young people learn about different topics and take part in activities linked to the exhibitions at The Museum every year. From 5 June 2014 to 18 January 2015, The Olympic Museum presents Chasing Time, which takes the visitor on a journey through time, as it is experienced in sport, socially, technologically and artistically.